Should You Let Your Kid Quit Music Lessons? A couple of days ago, Sophia had her very last violin lesson. Yes, you read that right. I let her quit music lessons after four years of sticking it out. It wasn't an easy decision for me at all and I feel like a great big failure of a music mom. The Maestro is the one who actually finally convinced me that it was time to stop trying to make violin lessons work for her and move on. And as much as it pains me to admit it, he was right. 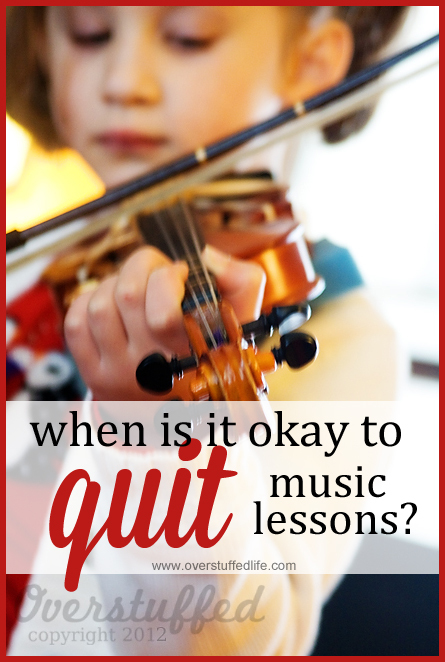 Every one of my kids has wanted to quit their music lessons at one time or another. I remember Bria going through a huge period of hating her violin and hating to practice when she was just about Sophia's age. But the thing is, she still practiced. And I can count on one hand the number of times I've ever had to remind her to practice. Because, see, even though her mouth was telling me how much she hated the violin, I would watch her practice and her body would tell me something different. Even if you ask her nearly 15-year-old self right now if she likes playing the violin, she'll probably say no with her mouth. But when you watch her play, you'll know that it just isn't true. I think most kids go through these phases when they want to quit their music lessons. I certainly did. I actually wrote a persuasive essay in my 8th grade English class to convince my parents that I should be allowed to quit piano lessons. And they let me! Quitting piano lessons in the 8th grade is one of my biggest regrets in life. Because now I am a serviceable pianist, but I am not really a good pianist. I wish I had persevered, because I use my serviceable piano skills every single day in my job as a vocal instructor. I can play several of the pieces I assign my students, but I butcher just as many as I play well. My own regrets have informed my parenting when it comes to music lessons. 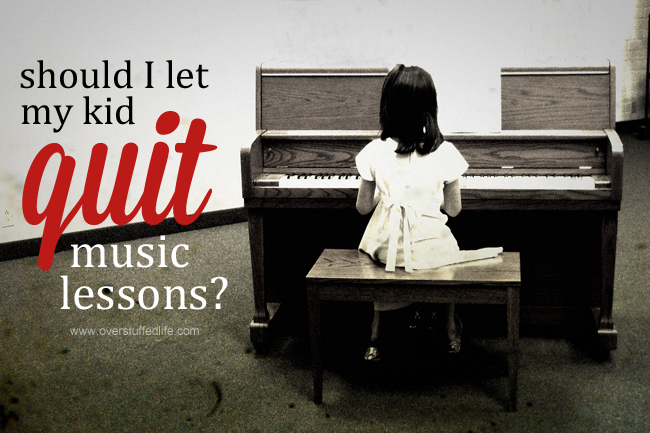 My girls are required to take music lessons, and quitting isn't an option. When you are the children of two professional musicians, this is probably to be expected. I know how to help kids practice. I have been doing it since Bria was a tiny 3-year-old. I know the gimmicks. I know the reasons why practicing is hard. And I mostly even know how to get them to practice anyway. And then came Sophia. I tried everything. I tried to make practice more fun. I have paid her to practice—both in M&Ms and real money. I have purchased fun music for her to practice. I have done a hundred other little things to help her learn, to make it easier, to make it enjoyable. Was I the most consistent mom in the universe? Absolutely not. But I tried so hard. 1. I wanted to kill her during every practice session. And maybe myself, too. 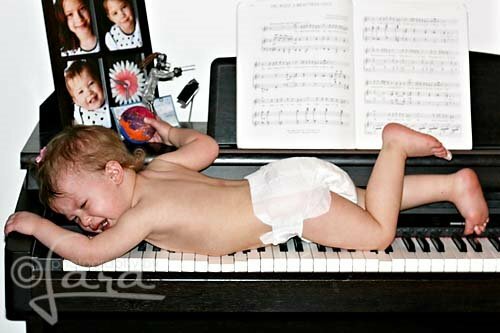 This is a toddler Sophia throwing a tantrum because she wasn't allowed to climb on the piano. A portent of things to come, I suppose. When 4 out of every 6 practice sessions result in an epic two-hour tantrum and about 3 minutes of practicing, it's time to re-evaluate. My Lyme diagnosis this year did not help, either. I used to have more fortitude to deal with it all and things would end a little better, but these last few months I have been no match for Sophia's iron will. I simply didn't have the wherewithal to fight with her every day. 2. She would rather stick forks in her eyes than practice, no matter how "fun" I made it for her. Practicing really did become a form of torture for Sophia. There were glimmers of enjoyment, but they were few and far between. She began to devise any method she could to get out of practicing and became really adept at distracting me from making her practice. She would interrupt practice sessions for every reason under the sun and did her list of after school chores so slowly that there would be no time for practice once she was finished. 3. She learned to play "Happy Birthday" on the trumpet before she learned it on the violin. The Maestro's instrument is the trumpet. While he doesn't play it often, he does do some professional gigs every once in a while (too bad his rock band broke up). Sophia has always been highly interested in his trumpet whenever he has it out. She begs him to let her play it, and he always lets her. Then she begs him to teach her how to play various songs on it. And she learns them. This kid can play "Happy Birthday" just great on the trumpet. And yet she still somehow struggles with "Twinkle, Twinkle Little Star" on her violin after four years of playing. It isn't that she isn't musical, it's that the violin is probably not the right instrument for her. She plays violin because she watched her older sister playing the violin and wanted to do it, too. I didn't put her in when she was 3 like I did Bria, either. I waited until she was 5, because we felt she was more ready then. The Maestro says that "the instrument chooses the musician"—just like the wand chooses the wizard in Harry Potter. Our plan now is to wait out these next two years and see which instrument chooses her for 6th grade band. If she wants to take up the trumpet, we will be thrilled. We will be equally thrilled if she chooses saxophone or flute or tuba or bassoon. She will still be required to play something, though, but we're going to give her a break until middle school. Most people don't know that Chloe began as a violinist, too. But her teacher and I quickly realized that it wasn't the right instrument for her, and we quit after just a few months. We waited a few years and then put her into piano lessons where she has blossomed as a musician. Now that she is in middle school, she also plays percussion and loves it. Pulling her out of violin was the right decision for her, too, because she found her musical home elsewhere. I just feel guilty I didn't see it more quickly with Sophia. 4. At the rate her progress was going, she would be lucky to finish Suzuki Book One by the time she graduated from high school. For me, her lack of progress was the clincher in our decision to let her quit. After four years she was still trying to learn Minuet 1, and that was just not an acceptable rate of progress. Plus, she would finally learn a song for a recital, play it surprisingly well, and then manage to forget it completely a few days later. Really. She still has trouble remembering the fingerings for Twinkle, which is the first song these kids ever learn. Violin just never started to become natural for her at all. Her teacher even bagged Suzuki for a while and put her in a more fun book. She loved that book but still had epic tantrums over practicing. Maybe if we had started her in that book from the beginning things would have been different. 5. Her dad is one of the most talented musicians I have ever met and he never picked up an instrument until he was 11 years old. Seriously. She's only 9 years old! Just because her older sisters were able to stick with their instruments from a much younger age does not mean that she needs to. The Maestro didn't have a music class or a music lesson until he was in 6th grade and the trumpet chose him. He knew it was "his instrument" at first hearing, and the rest is history. Sophia lives in a very musical home, she's taken up the ukulele recently and has fun with that, she's exposed to all sorts of music on a daily basis. She will be just fine musically. Quitting violin at age 9 will not have some sort of long term detriment to her musical abilities. 6. She was much happier playing with other people, while practicing by herself was excruciating. Violin is, by nature, a pretty solitary instrument. While many violinists play in orchestras, of course, the actual learning how to play is usually done alone. Sophia is, by nature, a pretty social being. She loves being around other people. She arranges playdates for herself on a regular basis and is unhappy when she doesn't have anybody to play with. She even hates having her own room! 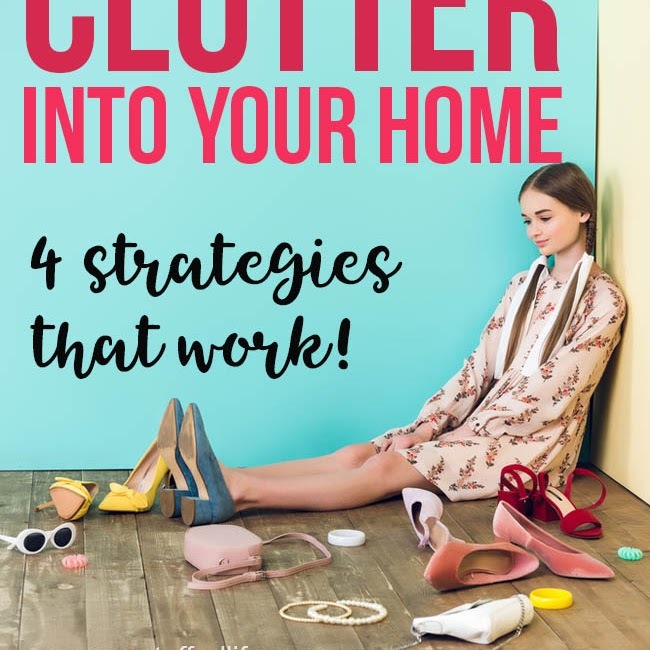 What child hates having their own room? This is another reason why I think learning something like the trumpet in an environment like middle school band will be more her speed. She will be surrounded by other kids learning their own instrument every day, and her own individual practice will be less demanding at first. Sophia's last violin lesson. She was happy, despite struggling to remember how to play her songs. The one thing I am grateful for is that Sophia really did love her lessons. Mostly because she loved playing duets with her teacher. And she loved her teacher—a wonderful teacher who was patient and understanding and tried many different ways to help Sophia progress. 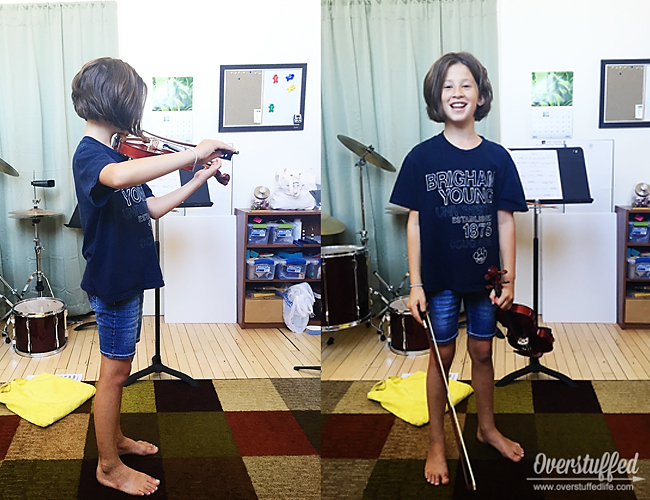 After every lesson she was totally jazzed about playing her violin and recommitted to practicing. But then practice time would come the next day and we would be back to the tantrums and fighting. During her last lesson Sophia even expressed regret at wanting to quit, but not enough to want to right all of the reasons why we decided to quit. Still, I think when it is all said and done that she will look back at violin fondly, simply because she did love going to lessons. If only I could afford for her to have a lesson every day! 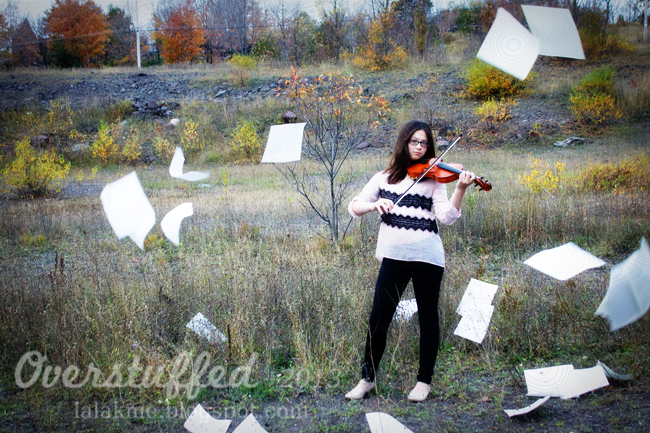 Sophia is quitting violin lessons, but she isn't quitting music. We will still find ways to keep her in music until she is in middle school, and then she will still be required to play in band. Music is too important to our family to let her quit entirely, but this has been a wonderful learning experience for me as a mother. Sometimes it is okay to quit. 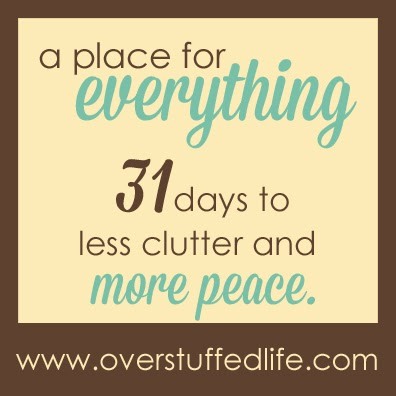 And sometimes it is actually the very best thing for your child.